Is this more than just a budget phone at a budget price? When you initially pull the Huawei Ascend G300 out of its box, the smart design brings a smile to your face, but it's not the only trick up its sleeve. Update: Vodafone UK has now released an official Android Ice Cream Sandwich update for the UK-spec Huawei Ascend G300, bringing Google's Android 4.0 software to the phone. Our review's been updated to take this into account. The Huawei Ascend G300 heralds a new chapter in the Huawei book, one that will soon be continued with the quad-core Huawei Ascend D Quad. Aiming to challenge established budget devices such as the BlackBerry Curve 8520, Samsung Galaxy Y and even coming in at similar monthly prices as the HTC One V, Huawei seems to have a job on its hands. 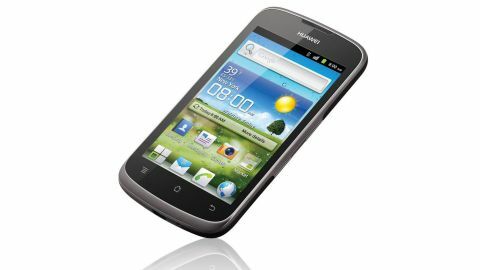 Huawei is no stranger to producing a budget device, with the unlocked Huawei Blaze retailing at £99 (around $160). The Ascend G300 does initially come locked to Vodafone, but also fights its way in at under £100 (around $160). Despite some necessary compromises, first impressions are promising. There's a 1GHz processor, large 4-inch 480 x 800 screen, and a flash for its 5MP camera. Unfortunately though, there is no front facing camera so video calling is out. For now, you get a custom Android Gingerbread (2.3.6) interface, with Vodafone now updating the phone to Android 4.0.3 in the UK. You'd struggle to tell by looking at it but the Huawei Ascend G300 is a budget device. Like most phones these days, the front is almost completely glass, and the metallic chassis shows itself at the top and bottom. With an almost HTC One X look about it, you'll find three capactive soft keys just below the screen. Huawei's opted to discard the search button, keeping only the Menu, Home and Back buttons. With the update to Android 4.0, the Home button also doubles as the multitasking key, with a long-press pulling up the list of recently used apps. At the opposite end of the bezel, there is a small LED light. It's well hidden, but flashes whenever you get a message, and lights up when charging. The colour does change, and can be customised in different applications. On the top edge you find the 3.5mm headphone jack moulded smartly into the body, as well as the screen lock button. While we might not always be fans of its placement at the top, as the Huawei Ascend G300 isn't massive, it's easy to hit one handed. The left hand side of the Ascend G300 houses the volume rocker. There's a nice dip in the centre which helps you control it, and it feels surprisingly sturdy. An uncovered MicroUSB port is located on the bottom, leaving the right side empty. The smart design also extends to the back. Made up of the battery cover, between stylish white plastic that curves round the side, the back also houses the camera and flash, as well as the loud speaker, another microphone and the obligatory logos. Behind the battery cover we can see the SIM card slot, 1500 mAh battery and a microSD card slot. You'll be pleased to notice that this can be swapped without removing the battery. Weighing in at 138g with battery, the Huawei Ascend G300 isn't too heavy in the pocket and while not pointing to the lightness of uber slim high end devices, it hints towards a sturdy construction. We don't expect you'll drop it much though, as it sits quite nicely in the hand. The 4-inch screen is responsive, and bright enough to use outdoors. Unfortunately though, we have to say that the capacitive buttons aren't overly sensitive, we found that we occasionally had to press the buttons more than once to get a response. Overall, the Huawei Ascend G300's styling makes it look like it's worth more than you paid for it, which can never be a bad thing. And the arrival of an Android 4.0 update gives it a new, modern feel as well.